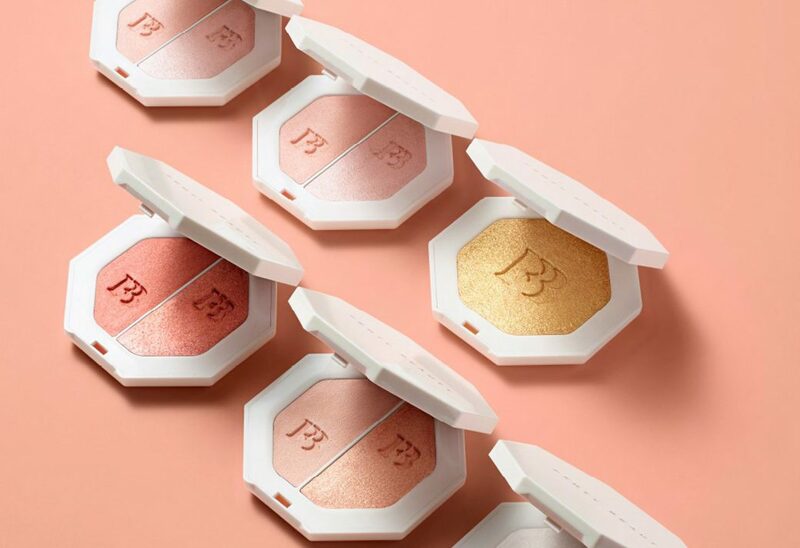 As someone with a demonstrated passion for highlighters, it’s entirely predictable that one of the things I’d be most excited about in the Fenty Beauty range would be the brand’s commitment to the sparkle –what’s entirely less predictable is that I would be disappointed with the product, but that’s exactly what happened. For better or for worse, however, the Killawatt Freestyle Highlighter ($42) is simply not a good highlighter for those of us already addicted to a great glow: it might be an amazing starter highlighter for beginners, but for the most part, it just doesn’t hold up to scrutiny when pit against other stellar luminizers. As much as I love all shiny things, it does seem that even within the field of highlighters my preferences have sharpened. I used to be won over by anything even slightly light-reflective, but now, what I look for in a highlighter is strobe-worthy pigment that builds fast and looks ethereal from the first layer: ironically, my biggest problems with this product might be what make it a good option for other people to begin with. The fine mill of the powder makes it perfect at blending well with most skin types and textures, but the result is a halfway-point between the Hourglass Ambient Lighting Powder ($55) and Becca’s Shimmering Skin Perfector ($46) that I find a little dissatisfying: there’s enough shimmer to stand out, but simply not enough pigment to stand out in anything but direct light. Some people might find this ideal for a daytime highlight, but it’s just not enough for me from a purely economic standpoint — I just wouldn’t pay more than twenty big ones for a highlight that requires support to register. I picked the Mean Money/Hu$tla Baby palette because champagne tones work well on my skin type. The highlighter has a unique mix of golden undertones and a teensy bit of tan-pink for balance. The powder blends incredibly well and smoothes away to almost nothing within seconds, yes, but therein lies the main problem: powder highlights should always be at least more vibrant than cream-balm highlights to stand out and effectively do their job. Even the sheerest layer of the RMS Living Luminizer ($47.50) stands out more than the Killawatt powder does, and the Hourglass powder actually sets better on the skin too, so there’s no real argument I can make for anyone to run out and purchase this highlight right now. My problem with highlighter powders that are too lightly pigmented is that when these items are applied onto a base like primer, foundation or even just well-moisturized skin, these powders tend to set and blend away instead of enhancing the selected points of your face like they should. The Killawatt highlighter tends to play support instead of taking centre-stage, and while that may work for others, it’s not what I like in my highlighter. In this tendency, the product is also supported by its secondary feature of not presenting overly complex colours, which seems a bit disappointing for a 2017 release. The single-pan colours are undoubtedly more brazen and striking than the colours in the double-pan palette I picked, but the problem is that they’re also much more basic in terms of composition: the white-gold of Metal Moon runs too cool and tinny to convey true luxury, while the hyper-metallic yellow-gold of Trophy Wife is a bit too yellow and not enough gold for my tastes. I’m satisfied with my own choice in colours, but it cannot be denied that even the lovely champagne shades that I do have do not perform the way a highlighter should; where other powders catch whatever light happens to glint your way, this one requires that a full beam be shone directly onto the face to catch any light at all. It does give me pain to pan a product that most of my sisters and brothers of colour are going ape over right now, but not every product is made for everyone. 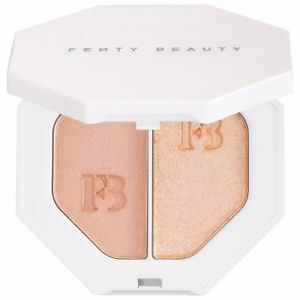 However, Fenty Beauty’s Killawatt Highlighter might be perfect for you if highlighters scare you, but for a committed addict like me, it’s a little lacklustre, to say the least.